True toys have no bells or whistles, they do not do anything and you do not turn them on. Most toys today have taken the fun out of imaginative play. 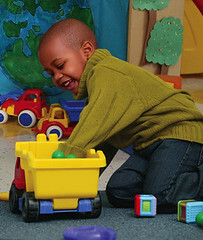 Manipulating toys and giving them life develops reasoning and problem-solving skills as well as creates a base of simple knowledge of how things work. Rattles – Fine motor development toy of the century. Grasping, repetitive motion that creates a desired outcome, music, hand-eye coordination and focusing visually on a moving object are all part of infant learning. Have rattles handy in a variety of colors, shapes, sizes and sounds. Blocks, blocks and more blocks – Spatial relationships, size and shape discrimination leads to early math skills, fine motor control as well as cause and effect. This true toy is fun at any age! A child may spend hours building and knocking down blocks while developing science skills including balance, gravity and concepts of weight. Paint and play-dough – It is messy and that is why they like it so much. This tactile experience will open the doors of creativity and thinking. Let them mix the colors, use different tools and add to the experience by playing some music in the background. Finger paint, paintbrushes and textured paint can be mixed with a variety of painting surfaces for further explanation. A ball – Look at everything you can do with a ball – kick it, catch it, sit on it, bounce it, dribble it, play alone or with someone. A ball develops gross motor skills, hand-eye coordination and encourages healthy practices. A child needs to learn to handle a ball before they can handle a pencil. Dramatic Play – Dramatic play is more than dress-up. It is a shovel, a whisk, a pad of paper. It is a pile of dirt, an old tire and a cardboard box. The sky is the limit – if your children have seen it, they want to explore it. Cut the cord off an old landline telephone and let them look inside as the telephone repair man. True toys for a four year old are simply real life items. These toys will allow children to try on new personalities and play out roles.